Coleman Moore (left) and Rus Lyons inside their shop at Adullam Outreach in Milwaukee. This is a follow up to our fall, 2016, story on The Custom Cottage, a furniture shop in Grand Rapids, Michigan, started by Coleman Moore. Coleman, a former pastor turned furniture builder, employs ex-cons, alcoholics, drug addicts, homeless men and veterans and trains them to become craftsmen. 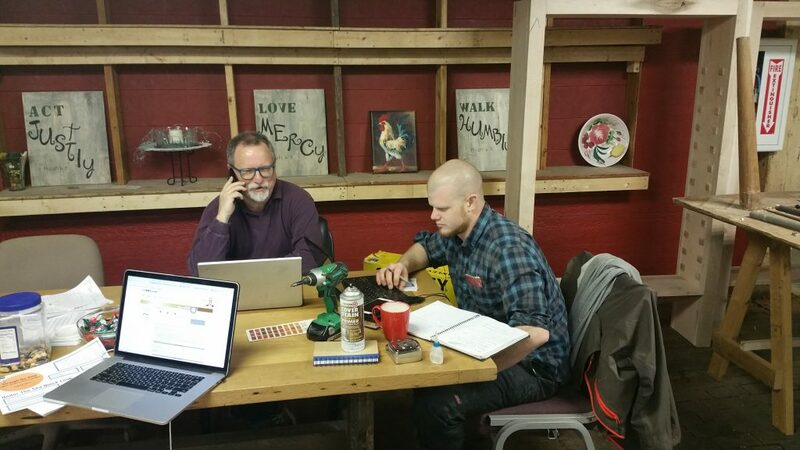 Rus Lyons moved to Grand Rapids in May of 2016, beginning the training that he hoped would eventually equip him to open a furniture shop in Evansville. He began by building bunk beds, then grappled with the subtleties of painting, staining and applying polyurethane. He pulled a couple of all-nighters in the shop, thinking about the long hours Jesus spent working with his hands. One day Coleman was at the chop saw. He turned to Rus and said, simply, "I love building." For Rus, his words were a revelation. Meanwhile, Coleman and his wife Mary were preparing to move to North Carolina. Coleman had already trained a partner to run the Grand Rapids shop, and he wanted to open a second Custom Cottage in Asheville, not far from his native Tennessee mountains. He dreamed of a retirement where he could pass his days building furniture, pausing to talk and pray with his fellow builders. In North Carolina, Coleman came close to leasing two different pieces of property. The first he called “ideal” and the second “even more perfect,” with mountain views and all the infrastructure he needed. But the deals fell through at the last moment, and Coleman returned to Michigan empty-handed. When Bobby walked into the old factory, he heard God speak to him: I have something for you here. His nerves jangled. Was God calling him to move to Milwaukee, to make a donation, or something else? Steve Grabosh, a former Christian punk rocker with flowing red dreadlocks, one of Adullam’s founders, led Bobby and the youth group on a tour of the 30,000-square-foot former factory. He showed them the second floor where Adullam held weekly prayer meetings and the Relief Center where volunteers distribute mattresses and furniture to fire victims and evicted families. Then he took them into a wood shop full of professional-grade tools. Steve and others at Adullam had dreamed of launching a job-training program in the shop, but the vision hadn’t come to fruition, and the tools had gone largely unused. 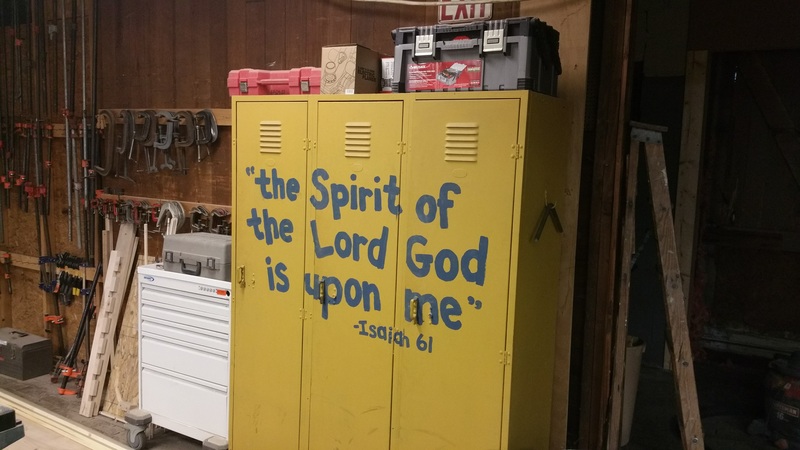 In the wood shop at Adullam Outreach in Milwaukee, even the lockers preach the good news. Standing in the wood shop, God spoke to Bobby again: This is it, this is what I have for you to do. He prayed, then set up a meeting with Steve, telling him about Coleman and The Custom Cottage. He also met Al Caldecourt, a retired engineer and furniture builder who had brought the tools to Adullam, hoping one day to build furniture there. With his wife Terri, Al had dedicated thousands of hours to improving the building, updating the electrical service, sheet-rocking and adding bathrooms, crossing items off an unending to-do list. But the father took his son’s words seriously. He made phone calls and began to pray about the situation in Milwaukee. A few days later, on August 13, 2016, a Milwaukee police officer shot Sylville Smith, a young African-American man, about 10 blocks from Adullam. That night, rioters burned police cars and a gas station, making national news. Coleman heard about it and his heart was moved. 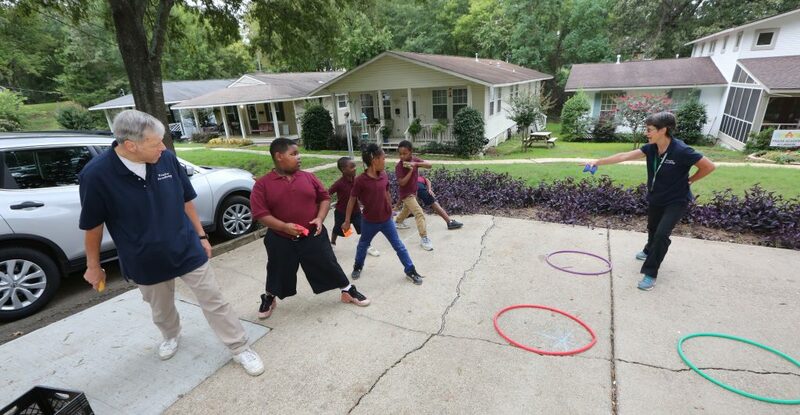 He learned that the 53206 zip code, just a few blocks away, has the highest incarceration rate in the country—just 36 percent of working age males have jobs. “It was a sign that this place needs The Custom Cottage more than Asheville does,” he said. Coleman put together a business proposal. He asked Adullam to charge The Custom Cottage only for their expenses until the business began to turn a profit. Adullam accepted the proposal and also gave the Moores free rent in a flat they owned nearby. After praying about it, Rus accepted an offer from Coleman to join him in Milwaukee, sensing an opportunity to build a business from the ground up without taking on the financial risks of ownership. The Moores and Rus moved to Milwaukee in early December. Coleman and Mary traded their 3,500-square-foot home on a country lake for a two-bedroom flat in North Milwaukee. The three of them lived beneath a feuding couple, and one night the woman screamed and jumped from the second story to get away from her lover. Another night, the Moores were surprised to hear a torrent of automatic weapons fire—then they remembered it was New Year’s Eve. Rus and Coleman worked together to set up the shop, building a paint booth and establishing relationships with suppliers. While traveling back to Michigan to get their first load of wood, the SUV Coleman was driving blew a head gasket, which proved a fatal blow for that vehicle. Soon after, Rus received a pickup truck donated by a friend from Minnesota. “It had no problem hauling 3,000 pounds of wood,” Rus said. Coleman and Rus built furniture for the showroom, put ads on Craigslist and filled their first customer order in January. By April, Rus had accepted an offer from Coleman to manage the shop. Coleman is still there, finishing pieces, while Rus deals with customers and builds furniture. Coleman and Rus say they are on track to hire their first local employee soon. Coleman and Mary both say that Rus has been indispensable. “We would not have been able to do what we’ve done without Rus here,” Mary said. Like Coleman, Mary, Rus and Steve, Al has been surprised by all that God has achieved. A year ago, none of them had dared to think that there would be a furniture shop open for business in the scarred heart of Milwaukee. Yet now inside the old factory, amid the hum of sanders and the buzzing of saws, there is no denying that Al’s tools are finally being put to good use. Soon they will be fulfilling their new mission, building lives by building furniture. I am astounded to hear of God's using you to love His people. Praying for your future plans. What a blessing to "see" our Father bringing Russ into his own in fulfillment of His call to him. This is an awesome example of the powerful work of kingdom building our God does with and through His sons and daughters, when they listen carefully to Him and respond. The power of God at work in these lives is truly awesome. Such humilty and obedience to God's call is filled with the Holy Spirit! WE in Tampa branch applaud your vision , determination ,and mission approach to this venture ! God will bless all who join and support you !